This is a simple recipe with only three ingredients. Almost every kitchen has carrots, potatoes, and rice so you do not need to rush to the supermarket to get them. 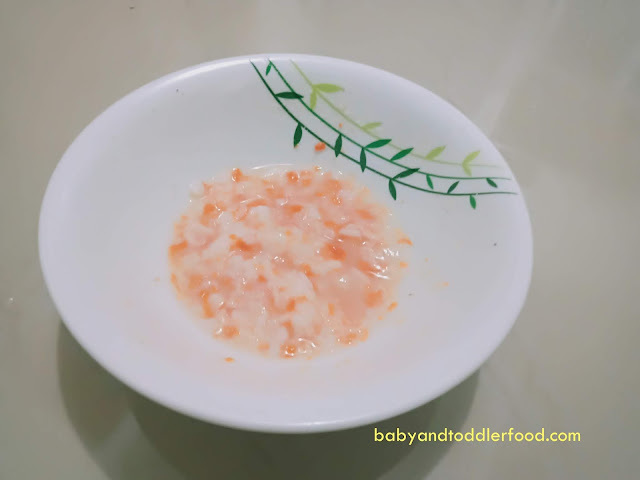 When your baby can eat rice, you can feed him this wholesome dish packed with beta-carotene goodness. 1. In a small saucepan, combine water and rinsed rice. 2. Bring to a boil. Reduce heat to low, cover, and simmer for 30 minutes. 3. Add diced potatoes and diced carrots. Cover and cook for additional 15 minutes or until soft. Add water if necessary. 5. Transfer to food processor or blender and puree until smooth. For older babies, you can use mash them instead.